The relevant excerpt from the Merseyside Police statement. Importantly, this was the opinion of the police FIVE months ago. Although the damage to the window appears to have been attributed by the media to a brick, no conclusive information is held that the brick (which was at the scene) caused the damage. So the question on everybody’s lips now should be, if no conclusive information is held that the brick (which was at the scene) caused the damage, what was it more likely to be? If the cause of the damage is and always was inconclusive, who were the police looking for during their unsuccessful investigation? Were they concentrating on potentially a vandal who’d put his boot through the window – unlikely given its height? Or did the police actually have whoever reported the incident privately under suspicion? Angela Eagle’s team were the same people who had failed to report criminal instances of alleged homophobia at the Wallasey CLP Annual General meeting on 24th June, just three weeks earlier – which served their own purposes as smears proliferated throughout the still unregulated UK media. Similarly, bogus, unchecked smears travelled UK-wide on this occasion – and the truth still wants an opportunity to get its boots on! 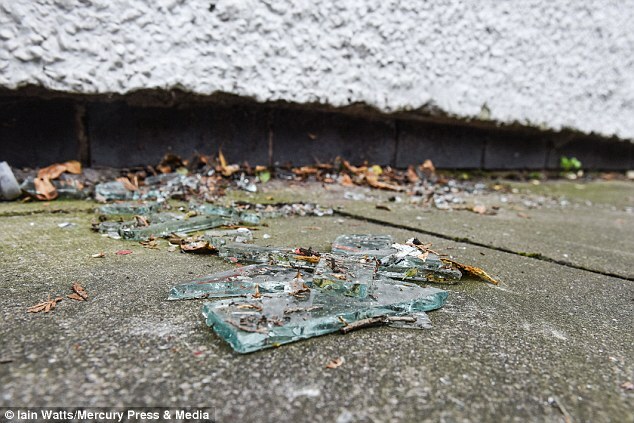 Remember how a photograph taken at the scene showed broken glass on the public footpath outside the building, whereas a brick being propelled through the glass from outside would surely have sent the broken fragments inwards? Or did gravity cause some pieces to dislodge, drop and fall outside after the event? Is the shape of the hole in the glass consistent with a brick? Or was the projectile / rock / lump of concrete simply described as a ‘brick’ for brevity? The reason we’ve placed the phrase ‘Angela Eagle’s Window’ in quotes is that the damaged window pane was not Angela Eagle’s window pane and never was hers and never will be hers unless Labour plan to assume ownership of the whole building. As previously explained in several of our blog posts, the broken window was a window to a shared stairwell used collectively by the building’s occupants i.e. the landlord and the Labour Party. I knocked on the door and asked to find out who actually used the building. As if wanting to draw a line under the matter, Wirral Council have since concluded that the incident was nothing to do with Jeremy Corbyn and his supporters and is in their opinion related to anti-social behaviour, with the building lying within what they term an anti-social behaviour hotspot. This local determination appears to have been reached in consultation with Merseyside Police at a meeting at the Manor Road station 300 metres from the Sherlock House site, and runs counter to all the bogus information, attacking Corbyn and his supporters that appeared in the newspapers and across the broadcast media throughout summer 2016. …notwithstanding the extreme, outside possibility which still exists – and which cannot be ruled in or out – but which has now become more likely given the Merseyside Police statement above – that the brick was potentially planted at the scene, the glass was broken by a party insider and the police have been given the runaround. 2. What was the physical nature / description / material of the projectile apparently thrown through and breaking the bottom left pane of the 12 shared stairwell windows on the ground floor of the north eastern elevation of Sherlock House on either 11th or 12th July 2016? i.e. was it a brick or a rock or a stone or something else? Please describe. IT WAS A BRICK. DESCRIPTION OF BRICK NOT PROVIDED. ALTHOUGH THE DAMAGE TO THE WINDOW APPEARS TO HAVE BEEN ATTRIBUTED BY THE MEDIA TO A BRICK, NO CONCLUSIVE INFORMATION IS HELD THAT THE BRICK (WHICH WAS AT THE SCENE) CAUSED THE DAMAGE. THIS INFORMATION WOULD NOT HAVE BEEN PROVIDED AT THE TIME OF THE INITIAL RESPONSE IN ORDER TO PROTECT THE INTEGRITY OF THE INVESTIGATION. EXEMPT INFORMATION 30(1) (3) IS MAINTAINED – DUTY TO CONFIRM OR DENY DOES NOT ARISE. THIS EXEMPTION HAS CHANGED FROM THE PREVIOUS RESPONSE OF EXEMPTION 30(2) INVESTIGATIONS AND PROCEEDINGS BY A PUBLIC AUTHORITY. SECTION 40(2) – EXEMPT PERSONAL INFORMATION – IS NEWLY INTRODUCED TO THIS REQUEST. 3. Do you have in your possession the projectile (brick or rock or stone or something else) that was reported to have been thrown by an unknown person and was later described in several local and national newspapers as ‘a brick’ thrown through a window? EXEMPT INFORMATION 40(5) DUTY TO CONFIRM OR DENY DOES NOT ARISE – IS NEWLY INTRODUCED TO THIS REQUEST. 4. Was there any evidence to suggest that the constituency office or office window of Angela Eagle MP on the ground floor of the south eastern elevation was subjected to an attack during the same time period? EXEMPT INFORMATION 38(2) DUTY TO CONFIRM OR DENY DOES NOT ARISE. THE POLICE AGAIN ADVISE US TO DO AN INTERNET SEARCH FOR THE WORDS “ANGELA EAGLE OFFICE ATTACK” IN THE FULL KNOWLEDGE THAT A PLETHORA OF FALSEHOODS EXIST CLAIMING THAT A STAIRWELL WINDOW IS ANGELA EAGLE’S OFFICE WINDOW. 5. Did you conclude after gathering evidence that the attack dated 11th or 12th July 2016 was confined to the shaired stairwell on the north east elevation of the building, and that the office or office window of Angela Eagle MP was not attacked given the nature of the evidence gathered? EXEMPT INFORMATION 38(2) DUTY TO CONFIRM OR DENY DOES NOT ARISE. THE POLICE AGAIN ADVISE US TO DO AN INTERNET SEARCH FOR THE WORDS “ANGELA EAGLE OFFICE ATTACK” IN THE FULL KNOWLEDGE THAT A PLETHORA OF FALSEHOODS EXIST CLAIMING THAT A STAIRWELL WINDOW IS ANGELA EAGLE’S OFFICE WINDOW – IS NEWLY INTRODUCED TO THIS REQUEST. …and will be appealing the matter to the First Tier Information Tribunal – as is our right. This entry was posted in Angela Eagle and tagged #Brickgate, Angela Eagle, Merseyside Police, Sherlock House, Wallasey, Wallasey CLP. Bookmark the permalink. I knew it. Outstanding work by Paul at the Wirral in it blog to get this far in spite of constant claims of exemption. Ask for the appeal to be heard in person and get a good lawyer to represent you. First-tier Tribunal is bloody useless and will ignore your arguments if you let them get away with it. I have to admit, I’ve had three visits to the First Tier Tribunal. Two of the cases were very strong. I was sent away flabbergasted by the apparent bias of the judge in the face of compelling evidence on both occasions. Serving the public interest appeared either not to figure or to be a deterrent against good, open practice. As for getting somebody to represent me it will have to be done pro bono or not at all, sadly. Nice one Paul (bedroom tax Paul here btw). I don’t get what their exemption about personal information is on about in q2. I can’t see what personal information you’re requesting there…. or am I missing something? Me neither Paul. It’s all about a brick. I’ll check that out with the ICO. I checked with the ICO Paul and they’re as in the dark as we are on that one. This case still puzzles me. It’s very puzzling. It’s become synonymous with its puzzling modus operandi, so much so, last night I woke up howling, ‘my God this is puzzling’. And so, having trawled through the entire threads generated by Cardin, this morning I got up determined to end this dreadfully puzzling case. I stood outside our front room, assured the neighbours not to panic and call the Constable, I picked up half a bloody house brick and threw it at my window causing it to smash. Quickly, c’os I didn’t want the scene contaminated, I got down on my hands and knees to discover that no glass fragments had fallen onto the floor outside my window. Excitedly, I scurried off inside the house to discover that the front room of the house was plastered in great shards of splintered glass fragments. Immediately, I thought, ‘hi up, this is puzzling’ and it was then I decided to take the next step to prove Cardins theorem that something wasn’t quite right. That’s right! I got another house brick, stood inside the Dining Room and with considerable force I threw it at the window smashing it. As before, I quickly discovered that no glass was inside the house and like before, all the bits of glass were outside, thus proving beyond doubt that the Wirral Window was smashed by an insider. Whatsmore, having proved this, and I believe I have, I can also say that this insider had at least one leg. Had the culprit no legs then it’s not unreasonable to conclude that they’d have been found at the scene trying to crawl away after carrying out this dreadful act. In fact, they’d probably still be there now. I’d now urge the local Constable to act on this, respect the integrity of my forensic investigations, get all the insiders together and if any of the staff are found to have no legs, eliminate them as not being suspect and begin to put an end to this puzzling case, commonly known as The Wirral Window. IF it WAS the brick that was used, then the implication is that it WASN’T thrown (as it would have ended up inside), and that it was held whilst breaking the window – ie shoved THROUGH the window – and then withdrawn and placed on the ground close by. And if it WAS the brick that was used, then either it was brought to the location or found somewhere close by, and if it WAS someone who had pre-planned it, then presumably they would have worn gloves, whereas if it was just a vandal and, as such, done on the spur of the moment, then it seems unlikely they would have been wearing gloves. The point being, was the brick tested for fingerprints or DNA. What with all the ‘publicity’ the event recieved, one would have thought THAT would have been an obvious thing for the police to have had done. I would suggest that it WAS premeditated, but NOT by any supporter of Jeremy Corbyn. The opposite in fact. Given the Big Lie concocted by a bunch of people attending the local party’s AGM that there was homophobic abuse towards Angela Eagle at the meeting, then I wouldn’t put it past such devious and underhand sociopaths to arrange such an episode. And then there was the Big Lie about the hotel in Luton cancelling the event because threats had been made. Who concocted that one, and got it into the media? As regards all the abusive phone-calls supposedly made to Angela Eagle’s office, was THAT complete fabrication as well. It wouldn’t surprise me one bit if it was, given what we KNOW these people are capable of. Given that Jeremy Corbyn had won the previous year with a landslide vote, and was hot favourite to win again, why would anyone have a problem with Angela Eagle making a leadership challenge. One should always ask regarding the alledged abuse: “who benefits from such actions, and who is it detrimental to”. The ruling elite and their newspapers – ie their medium for controlling what millions of people think and believe – have been smearing and villifying Corbyn from the outset, and THIS is just more of the same. Regards the “hundreds” of abusive calls supposedly made to Eagle’s constituency office by Labour members, how would anyone possibly know they were Labour Party members. Did they all phone up and say:” Oh hello, I’m a Labour Party member……and I think Angela Eagle is a #### and a total ##### and a ####### ####”. And isn’t it odd how not a single one of the people who supposedly made these calls has been traced by the police (unlike the guy who sent the email threatening to kill her and was promptly arrested). Did they all just happen to know how to avoid being caught in these days of mass surveillence. News reports said that staff at Eagle’s office had to stop answering the phones because of all the abusive calls. Well I don’t actually know, but would hazard a guess that there was just a couple of staff, and just a couple of phones – ie it’s not like there were ten, or twenty or more people answering phones, like at a call center. My point is this: Does it really sound plausible or credible that they – the staff – would only stop answering the phones after they had recieved “hundreds of abusive and homophobic and frigtening calls”…… So you’re getting all these dozens of “frightening” calls, and yet you just go on answering the phones to dozens more such calls until it becomes “hundreds”, and only THEN do you stop answering the phones. Yeah, sounds very plausible, doesn’t it! The reality is that by the time you’d received about a couple of dozen such calls you would stop answering the phone(s), and would have been onto the police in the meantime to report the abusive calls. As Adolf Hitler said: “The bigger the lie the better the masses will believe it”, or words to that effect. Dirty tricks? No, no, no, perish the thought. Given that over the course of the previous year Jeremy Corbyn had been villified by the corporate right-wing Tory press as an IRA sympathiser back when all the troubles were happening, how very odd that this guy should phrase/couch his threat in the way he did. And why would anyone think that Angela Eagle had any chance of winning the leadership contest when Jeremy Corbyn had previously won by a landslide, and was hot favouite to win again. Either he was completely demented, or it was a set-up, and I have little doubt which of the two it was. And then a few months later he goes to court (at Wirral Magistrates court) and gets a slap on the wrist in effect – ie an eight-week prison sentence, suspended for a year, and ordered to complete a 25-day rehabilitation order and 80 hours of unpaid work, and pay £200 costs. Does it sound like a credible sentence for threatening to kill/murder an MP, even if it hadn’t happened in the wake of the murder of Jo Cox, which it did of course. And isn’t it the strangest of coincidences that the NEC released it’s report re its investigation into all of this (alledged) abuse on the very same day that Stephen King appeared in court in Wirral. My, my, it couldn’t have been planned any better if it had all been orchestrated! Re my post about the alledged abusive calls, I just came across an article in the Guardian regarding the investigation, and it quotes from the report that: ‘intimidating phone calls that led staff to unplug the phone’. So there was just ONE phone in the office. The report of course is just one big stitch up from start to finish by the ‘New Labour’ mafia. The establishment are no way going to let good, caring people get into positions where they can change things for the better, either locally, or nationally. Just think GLC and the six metropolitan councils – all Labour controlled at the time – that Thatcher and Co abolished. THAT tells you everything you need to know about what the establishment think of democracy. Alan, on the anniversary of #Brickgate I want to thank you for your contributions here. Can’t respond to all of them sadly, but just to sum up quickly, the ‘brick’ was in fact a piece of masonry according to the police, so possibly more difficult to test for fingerprints. 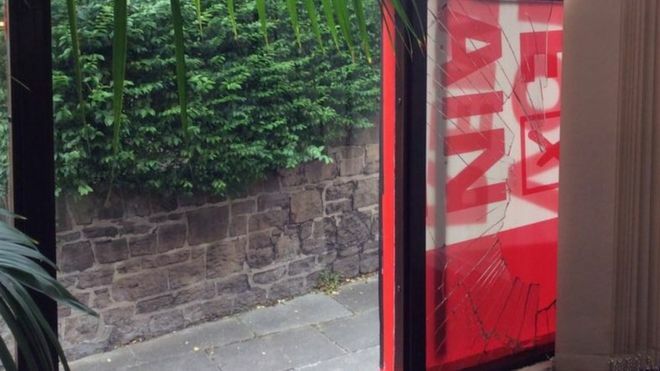 The police also confirmed back in February 2017 that the constituency office window around the back of the building was never reported as broken by the person who rang the police, The police reasoned that had it been damaged, it would have been reported. So I can summarise by stating confidently that we were lied to by the newspapers who were sympathetic with Angela Eagle’s leadership bid. This amounted to a dozen plus national dailies including the Daily Mirror. As for Angela Eagle, she fell silent and allowed the lies to be spread. She could have stepped in at any point after reading numerous headlines stating quite categorically that her constituency office window had NOT been broken and informed them that actually, a piece of masonry damaged the shared stairwell window on another side of the building. But she didn’t. As for IPSO, the so-called regulator, I lodged an official complaint but their committee – chaired and led by Paul Dacre (The Daily Mail) and Tom Newton Dunn (The S*n) deemed that the reporting had been truthful and accurate. We are very, very poorly served.